2,249 pages of Department of Defense files covering accidents involving nuclear weapons and lost nuclear weapons. 2,249 pages of Department of Defense files covering accidents involving nuclear weapons and lost nuclear weapons . Summaries describing the circumstances surrounding 32 accidents involving nuclear weapons. Twenty-six of these summaries were first released by the Air Force in 1977; another was prepared following the Titan II explosion in Arkansas in September 1980. This list of accidents was compiled by Department of Defense and Department of Energy researchers during December 1980-January 1981. The researchers reviewed all available records of the military services and DOE, applying a specific definition to determine if an event warranted categorization as an accident. Some events not covered by these narratives was included in a "Chronology of Nuclear Accident Statements/' released by DOD in 1968, due to a difference on the definition of a nuclear accident. The report notes that there never has been even a partial inadvertent U.S. nuclear detonation despite the very severe stresses imposed upon the weapons involved in these accidents. All "detonations" reported in the summaries involved conventional high explosives (HE) only. Only two summaries, for the incidents at Palomares and Thule, report a widespread dispersal of nuclear materials. On June 7, 1960, at McGuire AFB, New Jersey, A BOMARC air defense missile in ready storage condition (permitting launch in in two minutes) was destroyed by explosion and fire after a high pressure helium tank exploded and ruptured the missile's fuel tanks. The warhead was also destroyed by the fire although the high explosive did not detonate. 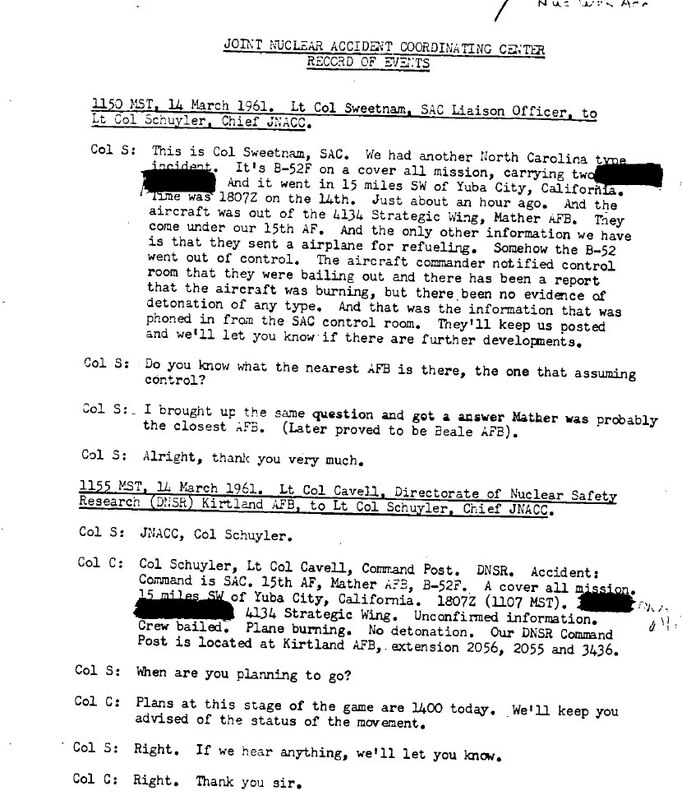 A transcript of conversations between Department of Defense personnel as they respond to a crash near Yuba City, California of a B-24F carrying two nuclear weapons. 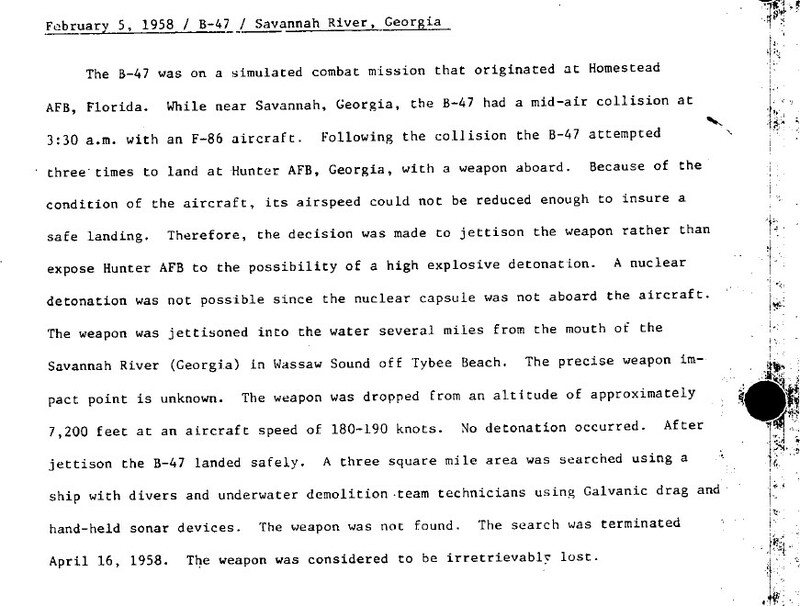 The purpose of this Ammunitions Letter was to present a periodic summary of incidents wherein nuclear weapons were involved, and to provide a resume of methods and procedures used by Explosives Ordinance Disposal personnel involved at each incident. 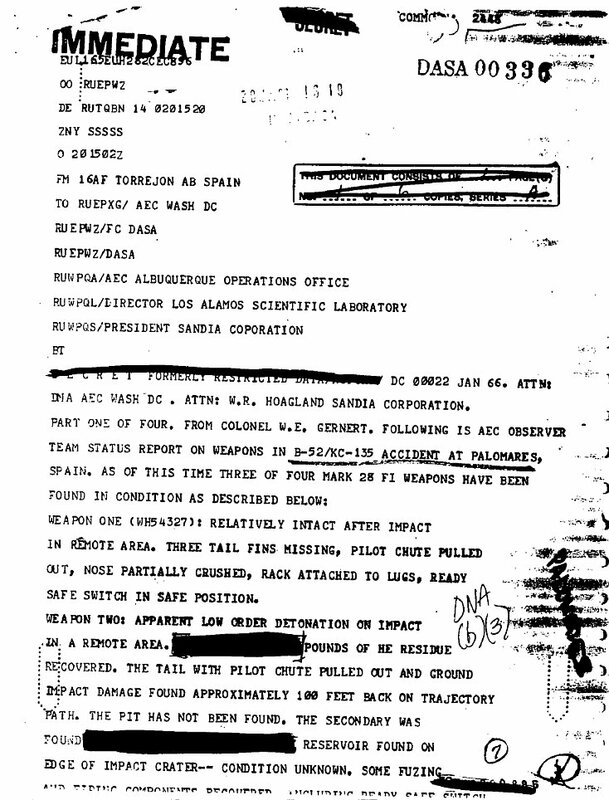 USAF REPORT ON THE RECOVERY OF NUCLEAR WEAPONS: PALOMARES - On January 17, 1966 a B-52 and KC-135 refueling plane were in-flight near Palomares, Spain. The two aircraft collided during a routine high altitude air refueling operation. Both aircraft crashed near Palomares, Spain. Four of the eleven crew-members survived. The B-52 carried four nuclear weapons. Three were recovered on the ground, and one was recovered from the sea, on April 7, after extensive search recovery efforts. Two of the weapons' high explosive materials exploded on impact with the ground, releasing some radioactive materials. Approximately 1400 tons of contaminated soil and vegetation were removed to the United States for storage. PALOMARES SUMMARY REPORT - A 217 page report produced in 1975 by the Field Command, Defense Nuclear Agency, Technology and Analysis Directorate. Headquarters, Commander In Chief, US Pacific Command Plan for the Recovery of Nuclear Weapons. 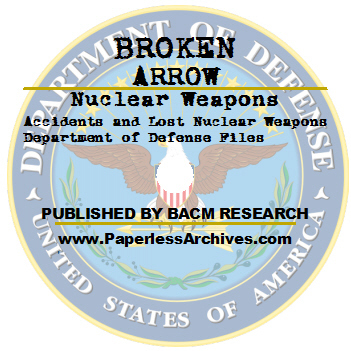 This document outlines the plan to be executed upon receipt of an OPREP-3 PINNACLE/BROKEN ARROW report that indicates a nuclear weapon or nuclear component has been lost, seized, or stolen from USPACOM custody, facility or transport. 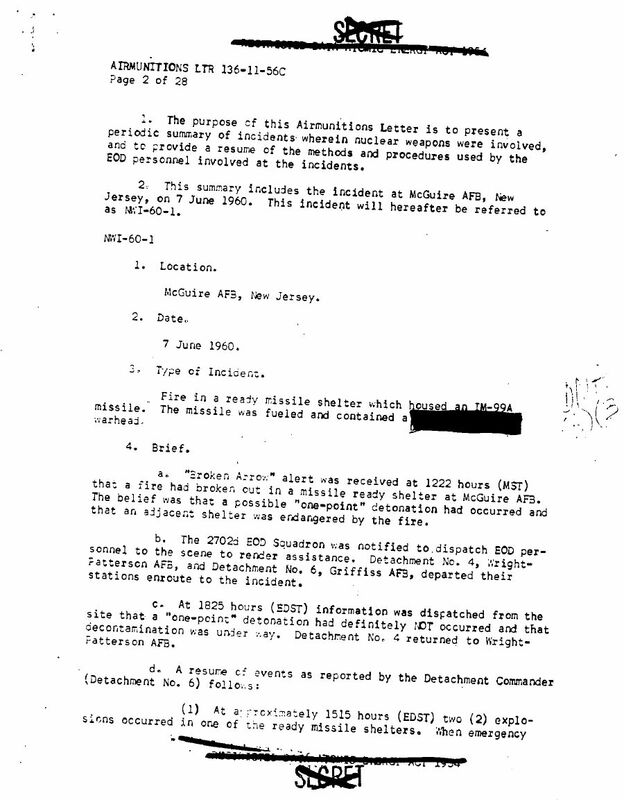 U.S. Air Force nuclear weapons accident/incident report messages 1966 to 1977. A collection of messages concerning PINNACLE/BROKEN ARROW level incidents. Pinnacle is a Chairman of the Joint Chiefs of Staff OPREP-3 (Operational Event/Incident Report) reporting flagword used in the United States National Command Authority structure. The military uses the term "Pinnacle" to denote incidents of interest to the Major Commands, Department of Defense and National Command Authority, in that it: Generates a higher level of military action; Causes a national reaction; Affects international relationships; Causes immediate widespread coverage in news media; Is clearly against the national interest; or Affects current national policy. This report contains a summary of Department of Defense (DOD) nuclear mishaps from 1950 to 1980. Excerpt from a newsletter for United States Air Force personnel responsible for nuclear safety. Includes an article on the Palomares incident. 1611th Air Transport Wing (M), (MATS) letter to HQ U.S. Army Training Center, Infantry, Subject: Radiological Decontamination dated January 26, 1961. 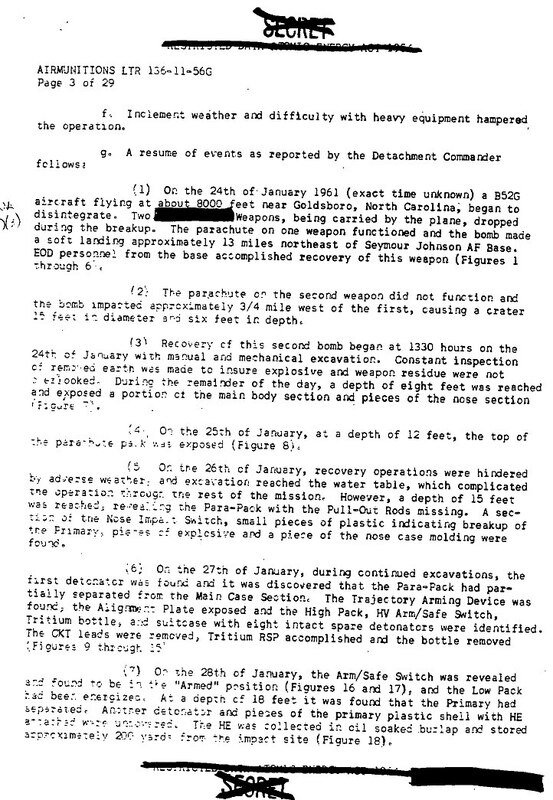 "Accident Report of B-52/KC-135 Mid-Air Collision near Hardinsburg, Kentucky," Atomic Weapon Data, Abstract, dated October 1959. This manual establishes a standard Department of Defense (DOD) Nuclear Weapons Technical Inspection (NWTI) System. It delineates policy, assigns responsibilities, and prescribes standard procedures for conducting NWTl's of all DOD nuclear-capable units. It also establishes the relationship between the Services and the Defense Nuclear Agency (DNA)concerning NWTI's, and provides consultative staff visits, data review and analysis of NWTI's reports, and symposia. On December 20, 1990, Secretary of Defense Cheney chartered a five-person independent Federal Advisory Committee to assess the current and programmed U.S. Nuclear Weapons Command and Control System's (NCCS) capability to meet the dual requirements of assurance against unauthorized use of nuclear weapons and assurance of timely, reliable execution when authorized, and to identify opportunities for positive measures to enhance failsafe features. In addition, the Advisory Committee was specifically tasked to explore the desirability and feasibility of placing coded control devices on U.S. nuclear weapons at sea; the desirability and feasibility of placing post-launch destruct devices on U.S. nuclear weapons as an additional safeguard against an unauthorized or inadvertent launch: and potential measures to reduce the risk of nuclear war occurring as the result of an accident, misinterpretation, miscalculation, terrorism, unexpected technological event, or deliberate act..
A 1980 report on the Grissom Air Reserve Base accident site. On 8 December 1964, during a routine Operational Readiness Inspection, a B-58 strategic bomber skidded off the runway at Bunker Hill AFB IN (later named Grissom AFB). The consequence of the accident was a fire and destruction of five nuclear weapons on the aircraft. The high explosives in the weapon did not detonate, but melted and burned, leaving residual radioactive contamination in soils adjacent to the runway. The contaminated area was excavated and buried along with the aircraft wreckage at a different location on base. 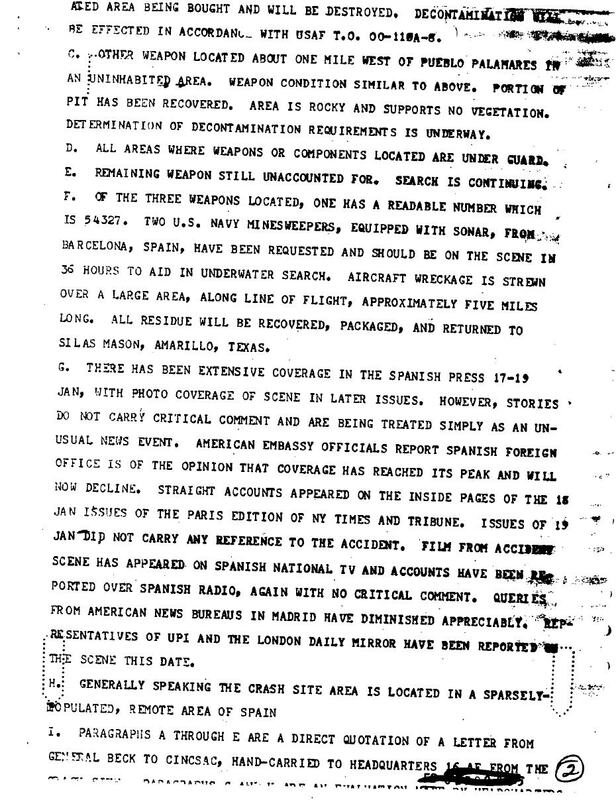 A 1983 report on a Defense Department nuclear weapon accident exercise. A joint Department of Defense, Department of Energy, and Federal Emergency Management Agency Nuclear Weapon Accident Exercise, NUWAX-83, was conducted during the period 5-10 May 1983 by the Defense Nuclear Agency. The exercise included the United States Navy, the Department of Energy, the Federal Emergency Management Agency, and the Commonwealth of Virginia (COV) as the major participating players. NUWAX-83 was the third such full-scale exercise of the nation's nuclear weapon accident response capabilities and was conducted at the Department of Energy's Nevada Test Site (NTS). This report presents an analysis of the site restoration options for the NUWAX-83 site, at which an exercise was conducted involving a simulated nuclear weapons accident. This analysis was performed using a computer program developed by Pacific Northwest Laboratory. The computer program, called DECON, was designed to assist personnel engaged in the planning of decontamination activities. Issued on August 23, 2013, this manual provides the procedures and organizational templates for Department of Defense components responding to accidents involving U.S. nuclear weapons. This Manual provides a concept of operations as well as functional information necessary to execute a comprehensive and unified response to a nuclear weapon accident.